A milium (single for milia) is a small superficial cyst formed in the top layer of the skin called the epidermis. They appear as tiny, pearly-white bumps just under the surface of the skin. They contain keratin (skin protein) and are harmless. They are often seen on the face, in particular on the delicate skin around the eyes. Milium are very common, white, pin-head sized, a milium is a small cyst containing keratin; they are usually multiple and are then known as milia that typically appear on the nose and cheeks. This condition is caused by keratin trapped beneath the skin surface. Cysts can be found around the eyelids, forehead, and on the genitalia. Primary milia may disappear in a few weeks or last for several months. This condition is commonly associated with genetic or autoimmune skin disorders, such as discoid lupus or lichen planus. 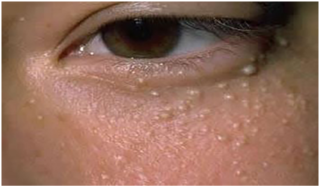 Milia en plaque can affect the eyelids, ears, cheeks, or jaw. The cysts can be several centimeters in diameter. This condition is primarily seen in middle-aged women, but it can occur in adults and children of all genders and ages. This type of milia consists of itchy areas that can appear on the face, upper arms, and torso. The cysts often appear over a span of time, ranging from a few weeks to a few months. These cysts occur where injury to the skin has occurred. Examples include severe burns and rashes. The cysts may become irritated, making them red along the edges and white in the centre. At our centre doctor will assess the milia at your Free consultation and advise you of the best option for your individual case. For the comfort of our patient milia treatment will be perform with topical numbness cream. Milia en plaque has been treated effectively with electrodessication, and cryosurgery. Hyfrecator / Electrodessication extraction – We use hyfrecator to cauterise the skin covering the milia then allowing the contents to be extracted.